The 18th of November 2009 will be the day that defines Giovanni Trappatoni’s reign as Ireland manager. In fact it is the day that will likely both buoy and haunt Irish football as a whole for years to come. The Republic of Ireland arrived in the Stade de France a goal behind from the home leg of the World Cup Playoff with almost everyone believing they faced an insurmountable task. Instead the Irish players took to the field in their changed white strip and completely outclassed the French XI. A team that had played in a regimented and constrained manner to that point under the legendary Italian manager, escaped from their shackles and took on their higher ranked opponents with confidence. Regardless of the Henry debacle that followed, the performance was spectacular and the post match talk was about the change of style that Ireland would be able to move forward with. The expectation was that the players would continue to play with their new found confidence, as the manager and the team talked up this positive approach. The change of style would never materialise though. Ireland trudged off the pitch in the Ernst Happel Stadion last Tuesday night, with the confidence of Paris still nowhere to be seen, and with the writing undoubtedly on the wall for “Il Trap”. In what had been billed as a make or break 5 days for the Irish national team, Trappatoni’s side returned no points. In Austria and Sweden, Ireland lost against two distinctly average teams, both of which had one superstar each, but not much else. The promising young players who impress week in and week out in the Premier League, look a shadow of themselves on international duty, while Stoke’s Marc Wilson recently admitted to communication issues in the dressing room under the Italian manager. With the Trappatoni era now finished though, where do Ireland go from here? Many argue that regardless of who is in charge, the players just aren’t good enough at the moment, but evidence suggests otherwise. With a larger contingent than Ireland have had in the Premier League for a considerable number of years, the current crop of players is one with great potential if managed by a coach who can instill confidence and a football philosophy in them. The names that have been mentioned in relation to the job so far have consisted of the usual suspects. Former Ireland managers, players, and by extension, anyone with any sort of vague Irish connection. 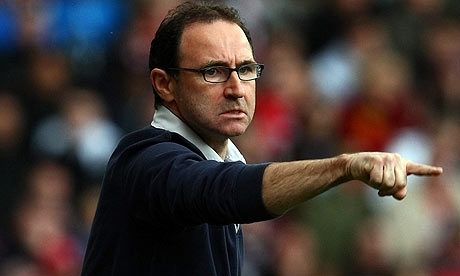 Martin O’Neill appears to be the clear front runner, and at this stage his eventual appointment appears inevitable. Would the appointment of O’Neill make any real difference though? Despite being the man who the majority of Irish fans seem to be calling for, O’Neill’s style of play has never been particularly different to Trappatoni’s. At the likes of Leicester, Aston Villa and Sunderland, the Northern Irishman advocated a primarily defensive style in conjunction with rapid counter attacks. As manager of Celtic, his style was more attacking but he had a squad far superior to their opponents, led by a world class striker in Henrik Larsson. Without doubt communication would improve under O’Neill but that is unlikely to be enough to change Ireland’s fortunes on the world stage. What Ireland need is a manager who will not only give the players confidence, but one who will impart an attacking and creative philosophy upon them. This is what leads me to believe that Rene Meulensteen is the perfect man for the job. 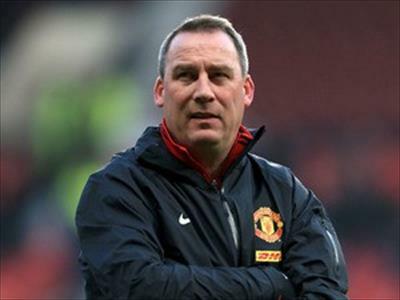 Born in the Netherlands, Meulensteen, 49, has spent the bulk of his coaching career with Manchester United. He arrived at Old Trafford in 2001 as a technical skills development coach with a primary focus on the academy and the younger players on the fringe of the first team. The likes of Danny Welbeck, Nani, Tom Cleverley and the Da Silva twins are some of the players from the current United first team set up that were molded by Meulensteen from an early age. No one witnessed more dramatic growth under the Dutchman’s tutelage than Cristiano Ronaldo though. Meulensteen worked one to one with Ronaldo on his attitude, while helping him to fine tune the natural abilities he had, with improved fundamentals. He isn’t a man with radical coaching philosophies, more a coach with a remarkable understanding of the basics of football, the mechanics. Meulensteen recently revealed the secrets of how he helped Ronaldo to reach that next level while in conversation with the Telegraph’s Henry Winter, and it’s striking how simple his message was. In 2008, he became First Team Coach at United and one of Ferguson’s right hand men. In his time with the first team, he cemented his reputation as one of the world’s best technical coaches. He worked with the likes of Patrice Evra and Antonio Valencia on their positional awareness, helped Ryan Giggs to reinvent himself, as well as working on pre-match tactics in the build up from game to game. Robin Van Persie credited Meulensteen for his strong form last season. Talking of Meulensteen’s game plans Van Persie remarked, “I have had a lot of good trainers, but it’s the way he prepares our team for games. Every match is different, so every training session in the build-up to games is unique.” This tactical savvy developed as a result of the young Meulensteen studying some of the greatest teams in history, and particularly the Dutch “Total Football” system of the 1970’s. He worked closely with legendary Dutch coach Wiel Corver, and strictly adheres to his coaching philosophy. Coerver believed that technical abilities could be coached and that the best teams were born of players who were coached to utilise their existing abilities. By studying some of the best players in the world, Coerver developed a coaching system which could teach skills and techniques to less naturally gifted players. The result is an attacking philosophy built upon working on ball control, first touch and passing, 1v1’s, speed, finishing and attacking as a unit. 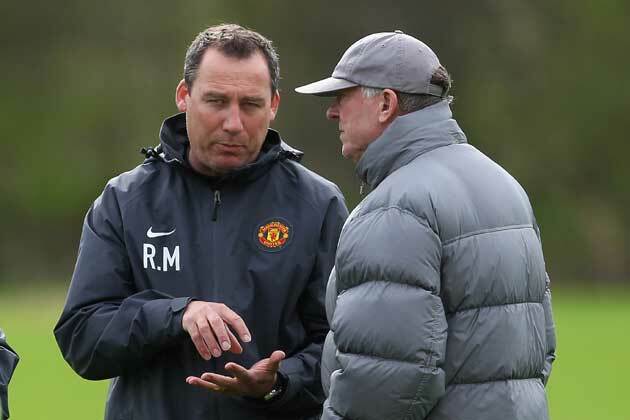 Below is a video in which Meulensteen talks a little about his own philosophies, as well as the Coerver school of thought. This, along with his own man-management style is what Meulensteen could provide Ireland. He could improve the fundamentals of the promising young core the Irish team currently has, while away from Senior games helping to construct a system and philosophy to best develop Irish football into the future. In 2008, the FAI appointed Wim Koeverman as International High Performance director. 4 years on, after Koeverman left to manage the Indian National Team, the relationship would largely be deemed a failure. The reason Meulensteen could succed where his fellow countryman failed is because of his intricate knowledge of coaching in England, in particular the volatile academy system that the majority of Irish players pass through. Who better to establish a philosophy from the ground up, or develop centres of excellence across the country than the man who was tasked with producing players for Manchester United. The argument of many is, that irrespective of coach, the current group of Irish players just aren’t good enough. They have been accused of being incapable of playing positive attacking football, and captain Robbie Keane has even come out and said that there’s no plan B for the National Team. The first step forward for Ireland needs to be a change of formation. 4-4-2 has long been an outdated style of play in international football as it allows the midfield to get overrun. Ireland need to adopt a 4-5-1/4-3-3 if they intend on being able to compete against the likes of Germany and Spain. To prove the quality of young players currently available to Ireland I have composed a team of players with an average age of just under 24. In other words, the core of players that will take Ireland through campaigns up to the 2022 World Cup. This is probably the most balanced starting line up of the three above, and the type of which could produce positive results when the qualifying campaign comes around for Euro 2016. It would mean that Ireland would be putting their best foot forward during qualification, while also building for the future. 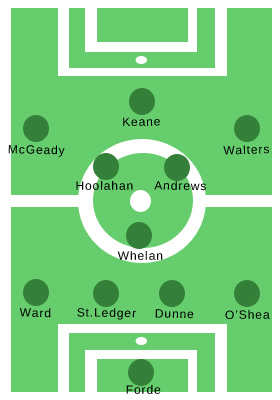 If you add to that team a substitutes bench which could consist of David Forde, John O’Shea, Joey O’Brien, Glenn Whelan, Jeff Hendrick, James McLean and Robbie Keane, all of a sudden Ireland have a fresh and exciting squad capable of adapting with more depth than there has been for many years. That would also be a squad with a solid mixture of experience and technical ability that could be more proactive in using substitutions and tactical changes to turn the tide their way mid-game. 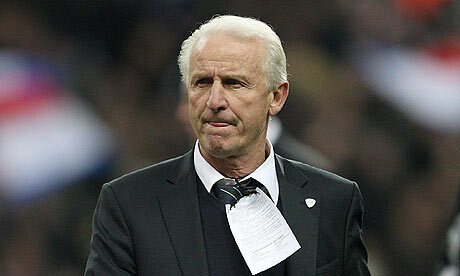 No matter who takes over the Ireland job, they have more options at their disposal than many believe. It’s rumoured that Martin O’Neill could be appointed as soon as Thursday, and although he may have some success, I’d worry that in the long term it would leave Ireland in a familiar rut. With a world class coach like Meulensteen, the FAI could completely revolutionise the state of Irish football and turn the team’s current fortunes around. As a young coach, who is available, has worked closely with some of the world’s best players, and learned at the side of the greatest manager of all time, it would seem that it would be remiss of the FAI not to consider Meulensteen’s credentials. Unfortunately though, with their track record, he may not even be on Ireland’s radar. For anyone who wants to see Meulensteen’s coaching in action, below is a video containing a large amount of footage of many different drills and methods he uses.